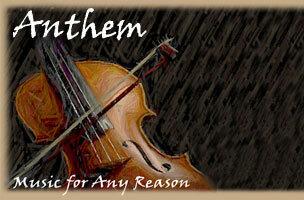 monthly e-mail, please drop us a note at info@musicbyanthem.com. The Anthem String Quartet and Keltish have some exciting performances coming up in the next few weeks! Come on out for great music. We would love to see all of you, and you can pick up our CD if you like. -- Island Time (Chelle Fulk and Peter Kudelich) - folk music from around the world, played on fiddle, guitar, and piano. Thanks for your support of my musical adventures! I hope our paths cross soon! Get invited to a Wedding! 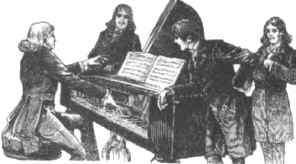 Anthem's musicians are busy playing for weddings, ceremonies, receptions, and a panoply of private functions. If you always wished you could hear how our quartet would sound at a wedding, your wish has come true. We stage mock-weddings and open-rehearsals on occasion, at which you can witness how our array of selections will enhance your ceremony or event. Email info@musicbyanthem.com if you'd like to be put on the invitation list for our next event.